If you sell consulting or professional services, what you’re really selling is your ideas. The better your ideas, the more value you’ll create for clients, and the more you’ll charge. But when was the last time you thought about the quality of your ideas? Are you ideas any good? Could they be better? How can you make them stronger? 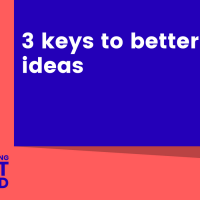 In my experience, there are 3 keys to developing better, stronger ideas. When I sleep well, my brain is overflowing with good ideas. When I don’t sleep well, everything goes down the drain. Your brain needs time to unwind. If you’re always on the go, running from meeting to meeting, your brain won’t have an opportunity to process and organize your thoughts (made worse by a lack of sleep). Book some white space in your calendar. Take walks. Go for coffee by yourself. Your ideas are shaped by the information you consume. Bad information diet = Facebook, Instagram and Netflix. Good information diet = Good books, podcasts and articles from a wide range of sources. Do you have any tips on how to generate better ideas?